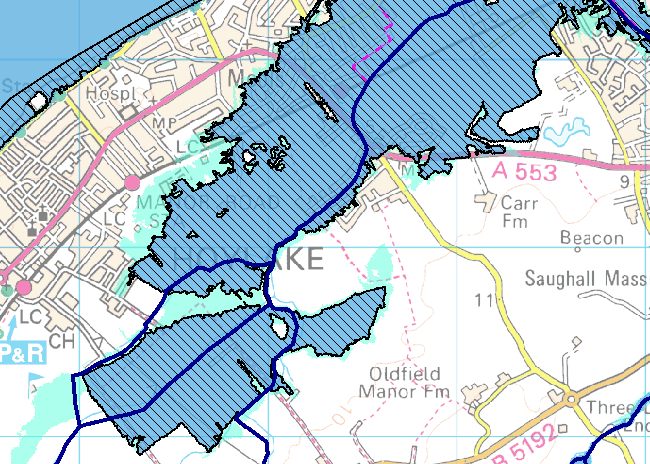 A flood warning for the Birket Valley encompassing Newton Brook and River Fender extending along the entire length of the Birket Valley to Birkenhead was issued on 23 February 2017 that can be seen on the screenshot of the EA map recorded at 09:17:31 HERE. On 22 February, total rainfall for West Wirral was 8.2 mm and for 23 February it was 10.7 mm (6.3 mm fell between 00:00 and 03:00). and as at Midday 26 February 2017 the rainfall was 1.2mm with showers and light rain predicted for the remainder. The average rainfall for Wirral, as a whole, in February is 99.9mm. Rainfall giving rise to flood warnings will occur regardless of whether or not the golf resort is built. But if built, the developer must take account of this extra inflow in the valley. A major problem for developers of golf courses is how big to build the water features that must be built for irrigation purposes because boreholes licences are not easily obtained today. A water feature used for irrigation of a golf course (two in the case of Hoylake's golf resort) must be sufficiently large to capture water for irrigation when rainfall is low. Because steep sides are dangerous, they cannot be dug deeply. Expanses of mud at the bank sides are unattractive and can be a safety hazard; water features cannot be built too large. The balance between area and depth to catch and retain sufficient irrigation water is complex leading to construction of multiple lakes. Entrapped water accumulates fertiliser, fungicide and pesticide chemicals, used in great quantities on courses, which can lead to eutrophication, which is dangerous to humans, animals and plant life. If the water features are too small, not only will there be insufficient water for irrigation at normal rainfall times but at periods of high rainfall, such as the time of this report, eutrophied water will escape into water-courses and damage downstream features such as the Meols Meadows SSSI. The developer must balance the volume of water features to cope with daily irrigation needs at times of normal rainfall with that of mitigating the flood risk to downstream housing and the requirement of keeping polluted water away from sensitive sites during times of high rainfall. A large volume of water was accumulating on 23 February 2017 in the Birket Valley. If eutrophied water was to over-top the on-site defences of the proposed Hoylake golf resort, not only could houses in Meols and Moreton be flooded but Meols Meadows SSSI, the only one of its kind on Merseyside, would be destroyed. Fortunately, with Cllr Davies' reiteration, in the Globe February 22 2017, of his resolute commitment to not allowing our green belt to be built on, the tricky but essential sum to equalise the in and out flow with size and volume of water features, has become unlikely.